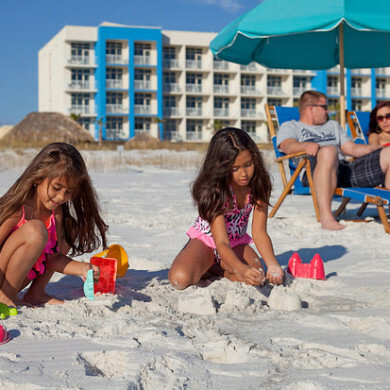 Fort Walton Beach has everything you need to create a memorable family vacation. With beautiful beaches, interesting history and bountiful inland attractions, there’s something for every member of the family. We hope you will visit soon to discover why you should make this beachside community your summer spot. To help you plan your vacation, here are our Top 10 Ideas for Family Fun in Fort Walton Beach, Florida. The Gulfarium is one of our favorite attractions on the Emerald Coast. Spend the day exploring exhibits, enjoying dolphin and sea lion shows and discovering new things about the animals you love. It’s the perfect place to learn about marine life while having fun. You can get up-close-and-personal with dolphins, seals, sea lions, sea turtles, penguins and many more. With miles of white sand beach in all directions, this is prime real estate for building your dream (sand) home. When you finish your sandcastle, write your name or memorable messages by the shore. And if you don’t mind getting really sandy, bury yourself (or a loved one) for an awesome family photo. The award-winning Emerald Coast Science Center, located in Downtown Fort Walton’s Landing Park, is packed with hands-on learning exhibits including a nature discovery room, a bubble room, the color and light exhibit, the Hall of Life, a critter room and more. Once you’re finished visiting the museum, you can head to the beautiful waterfront park behind it and enjoy the playground and a picnic with the family. If you’re a history buff or looking for a great day excursion, plan to tour the historical sites and museums that showcase Fort Walton Beach’s rich history. The Heritage Park & Cultural Center includes the Indian Temple Mound Museum, Camp Walton Schoolhouse Museum, Garnier Post Office Museum and a Civil War exhibit. One admission price covers all four. Witnessing dolphins jump, glide and frolic in their natural habitat is a magical and unforgettable experience. There are several top notch tour providers offering cruises throughout the day so you can choose the time and location that works best for your family. It’s best to reserve ahead but some places do accommodate walk-ons. Here are some of our favorite tour operators: Olin Marler Charters and Southern Star Dolphin Cruises. The Okaloosa Island Boardwalk is a great place to spend an afternoon for parents and kids alike. It offers covered picnic areas, volleyball nets, restaurants, shopping and nightlife. Grab a bite at one of the eateries and relax while watching the kids play in the water. Then, stroll along the boardwalk and pick up fun souvenirs at the local shops. Night crabbing is fun for all ages. It’s a great excuse to stay out a little late and enjoy the beach after dark. These tiny creatures, often seen scurrying along the shoreline between sunset and dawn, are super fun to catch. Simply grab a flashlight and a net, and head to the beach. Don’t be fooled by their small size … they can make tracks at speeds up to 10 mph! Be sure to set the crabs free after you enjoy the thrill of catching one. Stand-up paddleboarding is one of the fastest growing water sports in the world. Safe, fun and easy, the sport has taken the Gulf Coast by storm, particularly because it is best in flat water and low surf, and it is fun for the whole family. We recommend you paddle along the shore in search of sea life that gather around dock pilings, stop for lunch at a local soundside restaurant, and end the day paddling out at sunset. There are several places on the island to rent boards, take lessons and sign up for tours. Two of our favorites are SUP Express and Liquid Surf and Sail. If you want to see one of the area’s most intriguing inhabitants, we’d advise you to check out Gator Beach, the region’s only alligator attraction. Gator Beach at Fudpucker’s features more than 100 live alligators for your viewing pleasure. You can watch the gators, feed them … or, if you’re feeling super audacious, you can even get your photo taken holding a live one! They host live shows everyday from noon to 4 p.m. and are open 11 a.m. to 5 p.m. daily. When you’re done, check out the restaurant, arcade or water sports out back.